You've smacked Frieza across a 3D arena and wacked Cell across a 2D screen, now it's time to try a different way of duking it out between your favourite mega-powered Dragon Ball characters - a collectible card game. 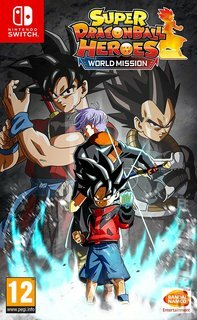 Super Dragon Ball Heroes: World Mission takes place in Hero Town, an alternate universe location where the most popular way of passing the time is with a Dragon Ball card game. You take on the role of Beat as he rises through the ranks in a bid to become the Super Dragon Ball Heroes champion. Things take a twist when villains from the game start showing up in Hero Town, however, and Beat must jump into the game to team up with his heroes and save the real world! In practice what that means is that you'll build your deck and select the heroes you want to place on a virtual board, teeing up the ultimate team and deploying them strategically to take out your opponents. It plays quite differently to its peers such as Hearthstone, and there's even a more interactive element to 3D battles that in other games would just be for show. You're frequently called on to time a button press, mash at the controls or wiggle an analogue stick to activate powers, making it more hands on than other games of its ilk. It's time for you to join the pantheon of Super Dragon Ball Heroes!